all the fluey chesty colds that have been going around. I always sense when its time to return to workouts following a break by my body giving me little clues...first will come the aching lower back, then my knees will start to hurt. 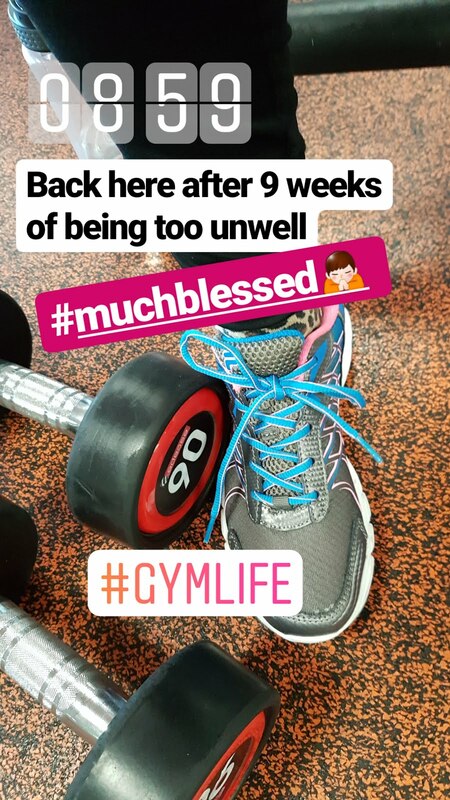 It would be really easy to interpret these little cues as reasons to NOT go running or lifting weights at the gym, but after a decade of back problems following an injury, and subsequent rehab at the hospital and then community gym, I've come to know my body pretty well! It would be so easy to get disheartened at this picture...these weights are as light as I go nowadays but I'm not going to start judging myself or feeling self-conscious that I'm 'only' bicep curling 6kg. Its not about how heavy any person can lift, it's about what sort of resistance they're up against. A young, healthy person who trains regularly and eats well will face far less resistance to lifting five times this weight than I am at the moment. So I'm going to give myself a pat on the back and enjoy the good feeling that comes from working out! Along with returning to exercise, I am going to be focussing on losing weight again. I was so poorly last month that feeding my body fuel to fight the virus was a priority. Also, the timings of my illness was spookily in line with hitting ketosis...and I spent seven weeks wondering whether so called 'keto flu' was what I was suffering with. Undoubtedly there was a bacterial infection on my chest because antibiotics dramatically improved things, but I can't help wondering if my body was getting itself used to ketosis. With this in mind, I am reintroducing a low carb diet very slowly, especially as I am now back to running and gym. I am not returning to eating bread, pasta or rice, and I can honestly say that I've given them up with absolutely no problem and haven't looked back! Same for potatoes, although I've had a couple of sneaky roasties and spoonful of mash when the flu was making me feel the need for carbs. I am going to be continuing with a small helping of porridge for breakfast or lunch, and possibly replacing that with an exciting new breakfast smoothie from Nutribuddy which I am going to be trying out and reviewing soon, to see if it can help with losing some pounds that went back on over Christmas. I'll check in soon to let you know how things are going!